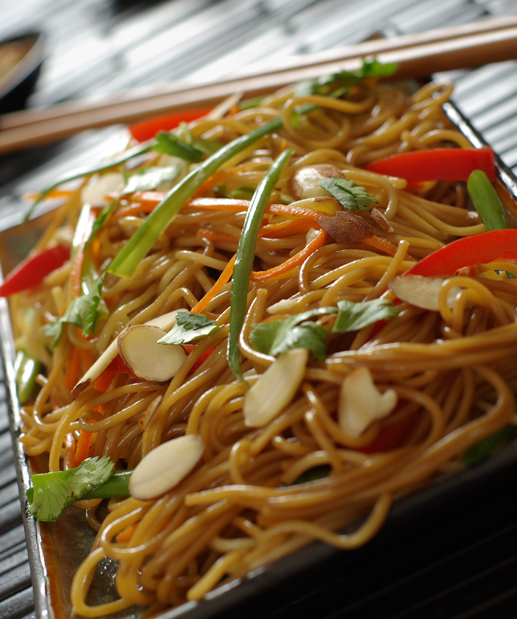 Pasta is always a hit with kids and lo mein is no different. Teaching children to eat with chopsticks is great fun and opens the door to discussion of other cultures. Although many people believe Marco Polo discovered pasta in China and took it home to Italy, both cultures had their own form of pasta long before Polo’s worldwide adventures. In Italian, pasta means “paste” in reference to the method of creating dough from flour, eggs. If you want to make this dish a main course by adding a protein try tofu or chicken. This dish is an excellent choice for the lunch box because it can be eaten warm or at room temperature and extra marinating will only make the noodles more flavorful. 1. Cook the lo mein noodles in salted water. Cool. Toss lightly with sesame oil to prevent sticking. 2. Combine the hoisin and soy sauces and mix well. 3. In a wok or a large frying pan heat some canola oil and quickly sauté the ginger, garlic, and scallions until they release aroma, then add the carrots, celery, and red onions and briefly sauté before adding the bean sprouts. 4. In another, smaller frying pan heat some more canola oil and sauté the noodles. When they are hot and look pan-fried, or lightly browned, combine them with the other sautéed ingredients. Coat stir-fried ingredients with soy/ hoisin mixture. Finish with the chopped cilantro and serve.